Preheat oven to 375 degrees F. Spray tube pan with nonstick cooking spray. In a small bowl combine pudding mix and milk; whisk until mixture is smooth and begins to thicken. Stir in 1/2 cup of the chocolate morsels; set aside. In a large bowl combine cake mix, 1/2 cup oil, eggs and water; mix according to package directions. Pour out 1-1/4 cups of batter and set aside. Spread remaining batter over bottom of pan. Scoop pudding using a small scoop or 1 tablespoon in a circular patter 1/2 inch from edge of pan. Spread remaining batter over pudding. Bake 35-40 minutes or until toothpick inserted in center comes out clean. Cool 10 minutes. Invert cake onto round platter. Combine remaining chocolate morsels and half of the whipped topping in small bowl on HIGH 1 minutes or until melted; mix until smooth. Reserve 1/4 cup of glaze. Pour remaining glaze over cake. Spread glaze to edge of cake allowing glaze to drip down sides. Place strawberries evenly over top of cake and drizzle with reserved glaze. Garnish with whipped topping. The recipe has been linked to Joy of Desserts! How Nice to be Featured on A Pinch of this, that & the other! me three this is heaven! This looks so moist. Perfect for all the chocolate lovers. 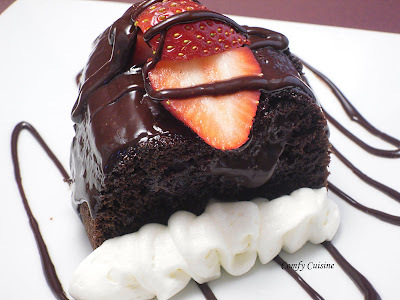 Thank you for linking up to Joy of Desserts. I can't think straight. All I can do is look at that mesmerizing cake. Must put this on my "to-make" list!! You should be speechless this cake is hypnotizing! Cake just doesn't get any better than this one, that's for sure!!! oh my gosh, Patti, this looks out of this world delish! I just gotta make this diet buster! Thanks for sharing. I love Cuisine at Home magazine recipes! all i needed to read was the title and "speechless" and i was convinced. thank you so so much for sharing! love this, love you, love your blog! ha. it's a party. i'll keep you updated if i make this! YUM!!! I love chocolate. And love especially gooey chocolate. I'm going to add this to my bake soon list. This looks unbelievable! 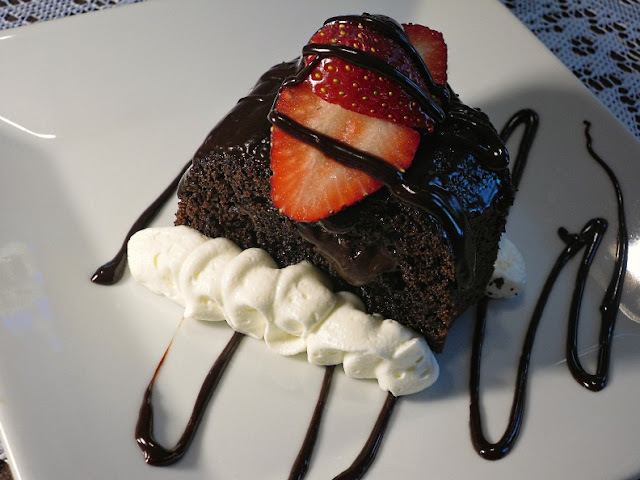 I'd love it if you'd be willing to link up a recipe at my link party this week, Whisking Wednesdays. I'm your newest follower. yum! This looks AMAZING! I love chocolate so this is right up my alley! Definitely bookmarking this recipe! I am your newest follower and would love it if you would check out my blog and follow me too! Thanks! Oh, this looks rich and delicious! I love it! Thanks for sharing on A Well-Seasoned Life's Sweet Indulgences Sunday. Thank you for linking up to Whisking Wednesdays last week. I just wanted to let you know I featured you this week. I'd also love it if you'd link up another recipe or two this week. Hope to see you there! That looks so sinfully delicious. I can g for a piece right now. YUM YUM YUMMY! That's all I have to say.